Bevels allow you to add decoration to your glass at the fraction of the cost of stained glass. Why not make your windows truly unique with a custom stained glass design. Examples of Stained Glass Windows. The choice for the best possible window energy rating performance and highest levels of energy efficiency in low/zero carbon new homes. 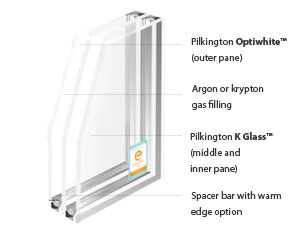 High performance triple-glazed units optimise the balance between U-values and g-values to maximise energy-efficiency. Very low U-values combined with high solar gain give optimal energy efficiency. Suitable for low and zero carbon homes as well as more traditional new build properties. Capable of meeting the requirements of the Code for Sustainable Homes, now and in the future without the need for soft coat options. 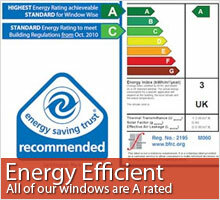 Exceeds Window Energy Rating (WER) Band A and Passiv Haus requirements. For privacy, pure style or to allow more light into internal rooms, decorative glass gives you a whole range of attractive options. From classic to contemporary, there are 18 different patterned glass designs to choose from.